Lendler, Ian. The Stratford Zoo Midnight Revue Presents: Romeo and Juliet. Illus. Zack Giallongo. Colors Alisa Harris. New York: First Second, 2015. This is the second time we journey to the zoo in Stratford-on-Avon after closing time to see what the animals are up to (for the first visit, q.v.). 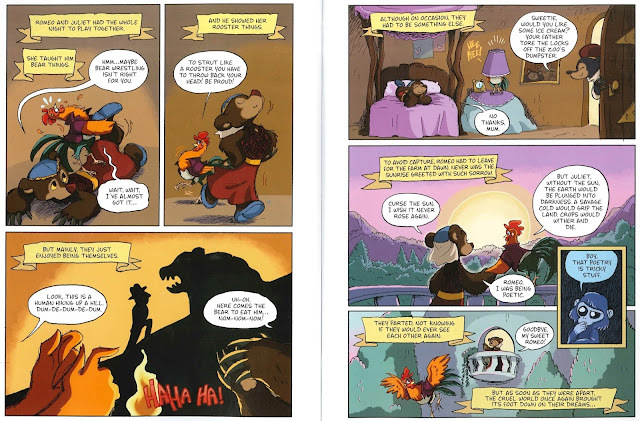 Previously, the animals put on Macbeth; this time, they turn their paws to Romeo and Juliet. I enjoyed this book, but not as much as I enjoyed Macbeth. In the Macbeth, the violence was present but diffused by the notion the king (the lion) was eating his enemies, which is generally-accepted behavior for lions. The violence is also circumvented by another means, but I don't want to provide a spoiler on that score! 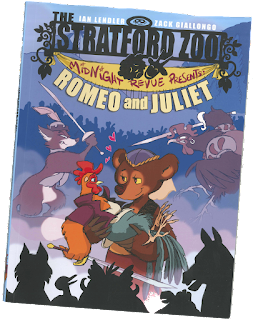 In the zoo's production of Romeo and Juliet, both the violence and the romance are diffused—and the means for doing so aren't quite as interesting or as effective. The petting zoo animals are the Montagues and the wild animals of the surrounding wood are the Capulets. The plot follows more-or-less accordingly, though Romeo and Juliet aren't romantically in love and [Small Spoiler Alert] they don't die at the end.